COBI, short for Connected Biking, turns bikes and e-bikes into smart bikes by connecting them with the rider’s smartphone. The modular system integrates six accessories into one exceptional design: dynamic front and rear lights, bike navigation, smartphone holder with charging function, bell, alarm and bike computer. It makes ride experiences more intelligent by integrating over 100 modern cycling-related features. The COBI hub constantly charges the rider’s smartphone, and his hands can remain on the handlebars thanks to the remote thumb controller. 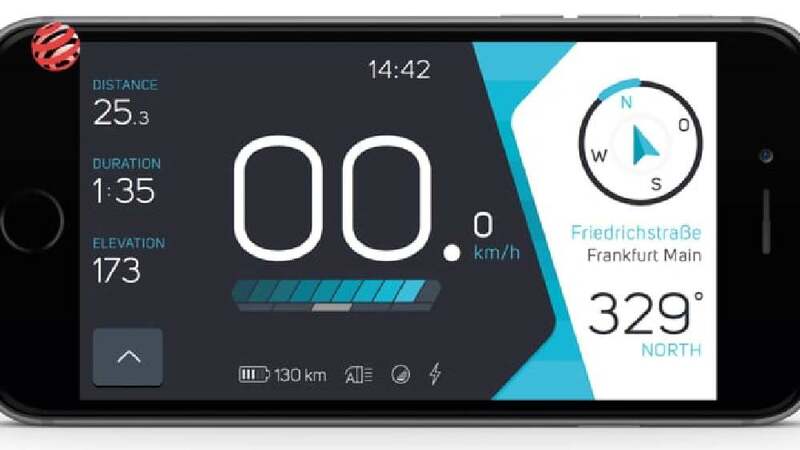 The rider’s smartphone serves as the command centre for the COBI system, and via Bluetooth, it is wirelessly connected with all COBI components. The clearly structured interface is intuitive, contextual and playful with full connectivity and social functionality. The app follows a highly concise and minimalistic design approach showing only the content which is relevant at any given moment in time in relation to individual scenarios and contexts. The app and its hardware are future-friendly, modular and constantly evolving. This app stands out through the innovative connection of various features that make rides safer while providing riders with a multitude of useful information. The dynamic and highly sophisticated design convinces with its typographic approach and the minimalist, functional interface which skilfully combines software and hardware.